“Every Jew has two requests of God: a place in paradise in the next world, and a place on the Tel Aviv beach in this world,” wrote Sholem Asch, the Polish-born novelist, in 1937. Stretching five kilometers from its southern tip at the old port city of Jaffa to the new cluster of high rise hotels and condos at its northern end, Tel Aviv’s beach (or Tayelet as it’s called in Hebrew) probably looked a little different in Asch’s day. But I think of him as part of a long legacy of both travelers and natives who have sought refuge in those sands from Israel’s political dramas, which can gush like a Texas oil well. At the beach, I discovered Israel in all its vitality, without the conflict. I have been photographing in Israel for almost ten years. The beach is where I go to escape. I walk the full expanse of the shoreline, stopping every few feet to capture a moment. Others are there to escape, too: an eclectic mix of people—old, young, skinny, zaftig and maimed—interact there unlike anywhere else. Arab and Orthodox Jewish women, covered nearly head-to-toe, splash ecstatically in the waves. Suntanned Israeli men parade like peacocks in tiny speedos and large jewelry. Bespectacled, pre-pubescent Americans on teen tours, relatively new Russian emigrants, even newer Ethiopians, and the newest residents—exhausted Filipino or Chinese foreign workers. Everyone is there, and for the same purpose: to take a break. This is a nation filled with serious conversations and serious consequences, bad omens from the past and dire warnings of the future. But not on this sliver of sand. 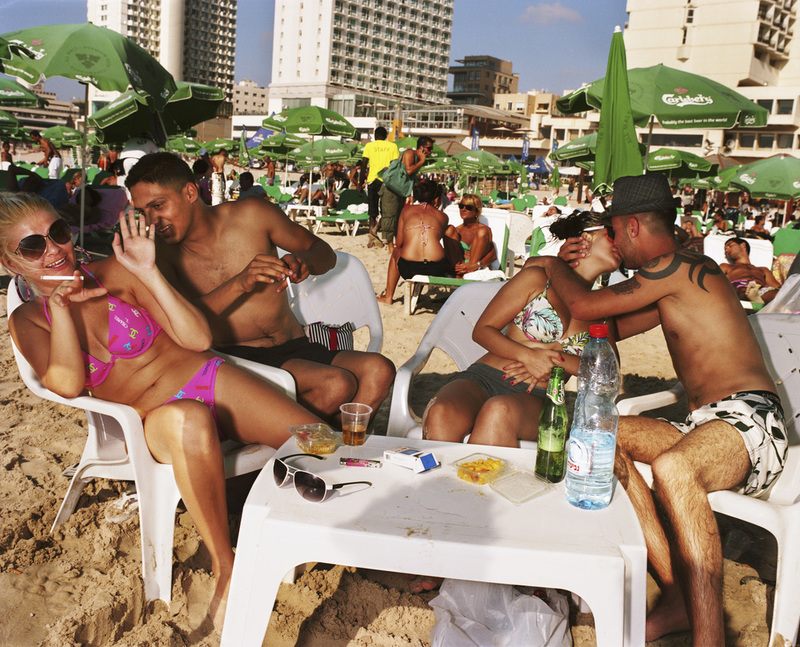 Only Tel Aviv’s beach has that unique ability to free Israelis from the yoke of daily turmoil, letting them frolic, flaunt and laugh—a joyful, if temporary, exhalation under a pure, blue sky. The beach, I’ve come to realize, is where the country comes to breathe. Oxana, 35, emigrated from the Ukraine as a teenager. She survived a suicide bombing in 2004, but became paralyzed two years later in a roller-blading accident. Her son regularly takes her to a spot on the beach that has a special ramp for handicap access. Aharon, who emigrated from Ethiopia, changed his name to make it sound more Israeli. Suliman: Our family comes from Sudan — we came to Israel for a better life. We live in a village pretty far from Tel Aviv, but our mom brings us here because we love to swim and play in the water. Ayala and her family emigrated from Ethiopia when she was two years old. Oded and Michael play matkot—the Israeli form of beach tennis—almost daily on the beach. Malka sits with a snack of edamame on the beach. An Israeli family poses for pictures, under the impression that they are meeting a celebrity. Stav comes to the beach each week from Ariel, a city 25 miles away. She finished her military service last year and is now studying architecture. Israeli teenage boys get in shape as part their pre-military training. Two couples have a party on the beach. Ilan, photographed in his favorite post-work spot. A quiet spot on the northern side of the beach. Lior says she makes the journey from Eilat, almost four hours away, because this is her favorite beach. Shlomi tries to leave Jerusalem as often as possible, so he can come to the beach and think. Ruth sits at the same spot on the beach every day. Always carefully color-coordinating her hat, sunglasses, bag and bathing suit, the beach serves as her fashion runway. Shlomi, a lifeguard, patrols at his usual spot. 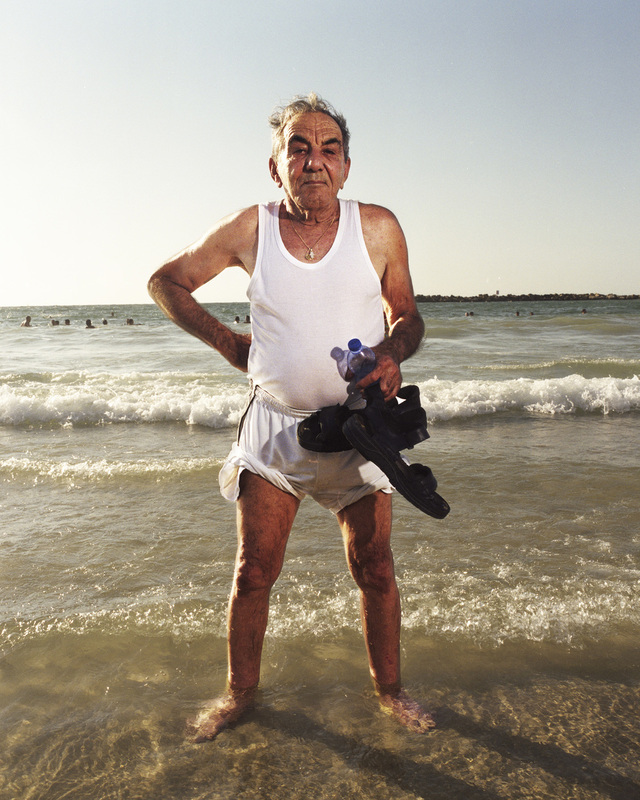 Yossi, 78, likes to come to the beach twice a day, at sunrise and sunset. Moses, who was born in the Tehran airport as his parents were emigrating from Iran to Israel, searches the beach every evening for coins and jewelry. Shlomi visits family in Tel Aviv. His father says the only thing in the world that's missing from their home city, Jerusalem, is the beach. Women watch the sunset while standing at the southernmost edge of the beach near Jaffa.